The girls had a photo shoot showing their cat attributes? Or at least their "paws" and their sharp "claws" - this I know must be the case because Ellie is constantly hissing at me and showing me her sharp claws and asking me to wash her paws.... *sigh* and I must admit...she's pretty cute when she does it! LOL! are away from each other. 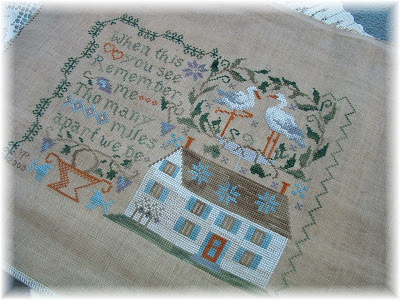 Homespun Elegance ~ "Witches Stitch Too!" that Terry is over the moon with my choice for her, and the Good Lord knows she's been waiting for a looooooong time for this, see I "owed" her one.....and finally I saw it through. Hopefully it was worth the wait in Terry's eyes? Let's hope so! We went to our county fair. I love fairs, the animals, the 4-H'ers, the food, the lights, even the smells...but my very favorite part is looking at all the Home Ec exhibits and especially the needlearts entries. You know here I'm going to once *again* show my ignorance....but I thought you had to belong to a Ladies Home Ec. Club to enter things in the fair....apparently I was wrong, so you know what? I got a list of all the entry categories and I'm going to enter something(S) next year....I was looking at what was entered and what won the Grand Champion ribbons and I think that, I could win some ribbons myself. Maybe. Next year. We'll see. are too simple to talk about. 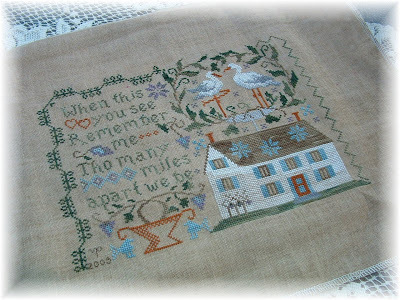 Country Cottage Needleworks/Crescent Colors ~ "Frosty Blue House"
Little House Needleworks ~ "Be True"
So another for my wall to squeeze in somewhere ;) Tonight I'm starting something else new that I think I can maybe get banged out in no time....we'll see! 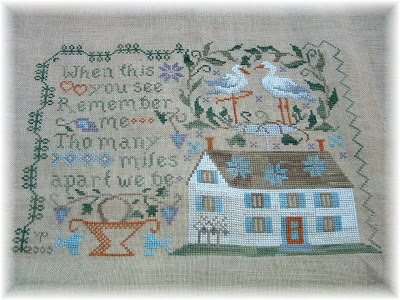 "Love and Best Wishes, as you count your blessings and your stitches, from our house to yours!" shining through it of God. Thank you Lisa, I love it very much! Yep, pretty much perfect for me! Thank you Sherry for holding a delightful drawing for us all to take part in! The Primitive Needle's "Earth Sampler"
of my beginning sampler wall....now it's in a "primitive" form, I left some holes on purpose to sort of fill in. And my husband told me that he was going to have to redo the whole gol'darn wall if I didn't stop hammering and I told him to get his work belt out because when I get finished this whole wall was going to have samplers on it from chair rail to the ceiling. To which I got a blank stare. :o) Men ye' of small minds....and sampler wall aspirations.... but anyway I digress...here it is folks in all it's sampler wall glory. 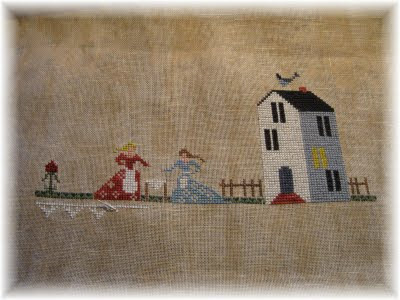 It is the wall behind my couch and I can see it from my stitching area....and smile drunkenly with happiness, while doing a jig and singing Danny Boy. Isn't it grand?! The pictures are a little dark....but I couldn't wait for sunlight...excited, I was!! this one is the "Quilt Stars" from the July Patterns - the colors remind me of a favorite quilt of mine that my Aunt Kate made....And although I think Alma and Barb's instructions for finishing are quite clear and easy to understand, I think I have an easier way and if not easier, maybe faster? 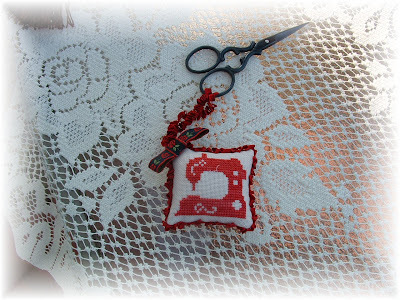 I've been thinking about it and I've had a lot of people e-mail me about finishing them, and "how to's", so I think I'll make a tutorial too....that way visual learners can see the step by step pictures. I'm visual myself....so I have to "think" in pictures and steps before I can do something. So I'm working it all out in my brain - All eyes trained here ;o) Maybe in the next few days (or weeks) I'll put one together. We'll see how fast I get this one done and then finished. 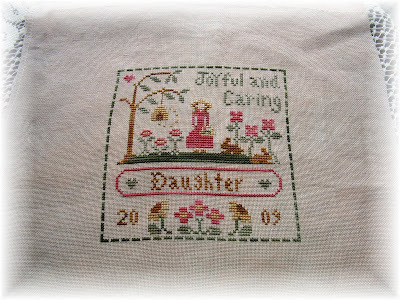 I think the stitching should be done by this afternoon considering my three BIG kids have Dentist appointments. So that does it for me folks.....back to the grind. as well as your soul! 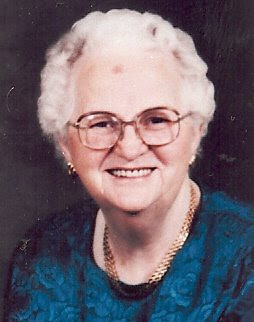 May her soul and all the souls of the faithfully departed, by the mercy of Christ, rest in peace. 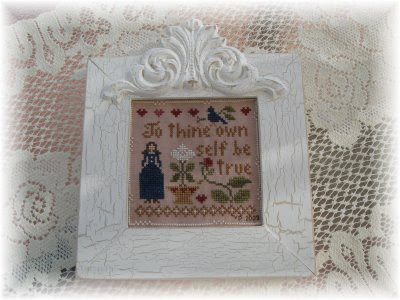 I've created a tutorial on "my" framing process - now this is my way, doesn't mean it is the "only" way to do it. 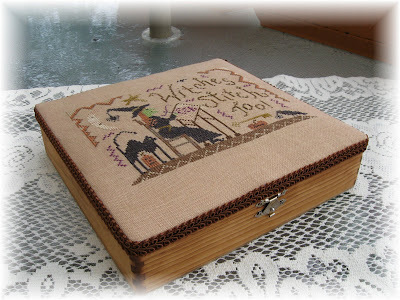 But anyway for those of you that are interested in learning the process that I've figured out for myself - click HERE I wish you many enjoyable hours framing your heirlooms! 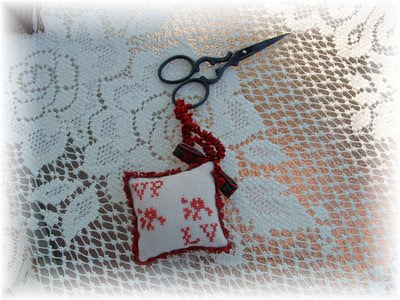 From Cathy B I received a gorgeous hardanger fob....isn't it simply beautiful? 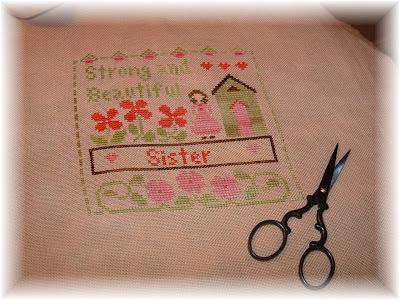 Here it is modeled on my Sarah Gingher's and I believe it shall stay on my Sarah's...utterly gorgeous! Thank you Cathy! Then I came to a package from Harmien...and it is just wonderful as well! 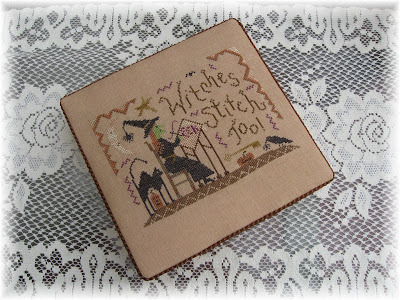 Here's Blackbird Designs "Pins and Needles" stitched by Harmien, it is so lovely... and as always she paid attention to detail and stained her lace with coffee, I believe. 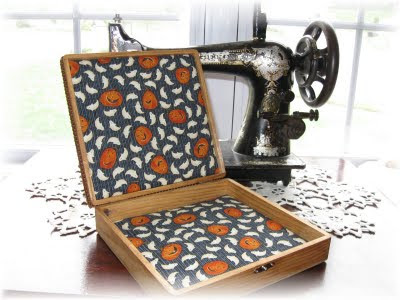 It's prim, it's a Blackbird Designs, it's wonderful...what's not to love?! Thank you Harmien!!! Harmien also sent a little present for our newest member, Master Lil' Red - she sent him some kitten mittens to play with....and let me tell you HE LOVES THEM! :o) Thank you Harmien!! And on the inside was a perfectly stitched and assembled Pincushion filled with walnut shells! I've always lusted after these little deals, and now I have one for myself! Here is is modeling some needles...Amy also sent me two packages of John James Needles...never tried them am excited to give 'em a whirl! But isn't this precious?! And it fits so well in my home too! Thank you Amy! On the back she included our initials and like I told her this morning...BFF's FOREVER! 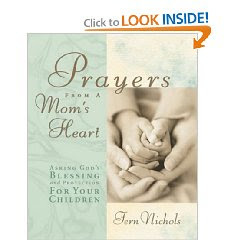 Thank you Terry!! I got a large cut of Picture This Plus "Earthen" lugana and 4 charts from The City Stitcher....I've recently become a huge admirer of Samplers, particularly primitive samplers...and The City Stitcher fits the bill with these lovelies...check out the "BEE SAMPLER" I'm thinking that will look pretty doggone nice framed and hung near "The Bee Man", huh? Thank you Julianne! 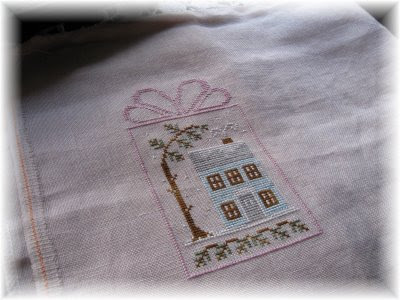 And lastly dear Annemarie sent a gift certificate to me too and I'm awaiting the arrival of Carriage House Samplings newest "Fredricka" to use it all up :o) Thank you Annemarie! Whew! What a haul, yes?! I am most thankful for the gifts, but the biggest blessing of all is just the friendship of these ladies....I appreciate it so much that they take time out of their busy schedules and lives just to do something special for me on my birthday...humbling! 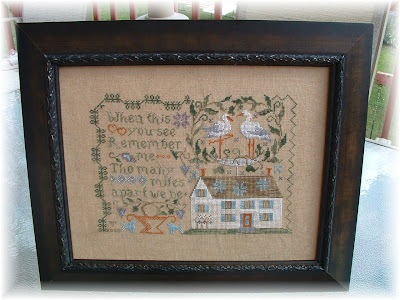 I got a frame for my Blessings and Kind Wishes...and am working on framing it and making a Framing Tutorial...so keep an eye here, if you're interest in learning how Vonna frames her needlework! I've had a lot of e-mails about it and I thought I'd just write it all down once for all to see, if they are interested, of course! since I've been working I don't have much to write about! LOL! I guess working keeps a girl outta trouble! :o) However I'd like to say, for my birthday my dear sweet husband and family took me out for lunch at the Olive Garden where we spent a delicious time pigging out on the unlimited Soup, Salad and Breadsticks (well the adults did - the kiddos had spaghetti, pizza, fettucine and chicken strips) :o) I love their salad and their breadsticks...heaven.... :o) And the gift from my family for my birthday was some lovely black side tables I've been wanting for some time. As my kids get older and less "hard" on furniture - we're trying to get some new stuff to replace the old crappy stuff. So my old crappy side tables are gone and my new ones look spectacular! :o) YAY! Some gifts are big, others are small. are the best gifts of all.